Yesterday, Nov. 13th, the propagation to VK was weak. Just a few spots from some European stations were reported. Alan, VK7BO mailed me that he would leave his receiver on, when possible. That encouraged me to continue the observations. Nov. 14th, I was checking to see if a free message with “TST PA2S JO21” would be spotted. Even though the band was quiet and it did not look like it was open, mother nature had other thoughts. 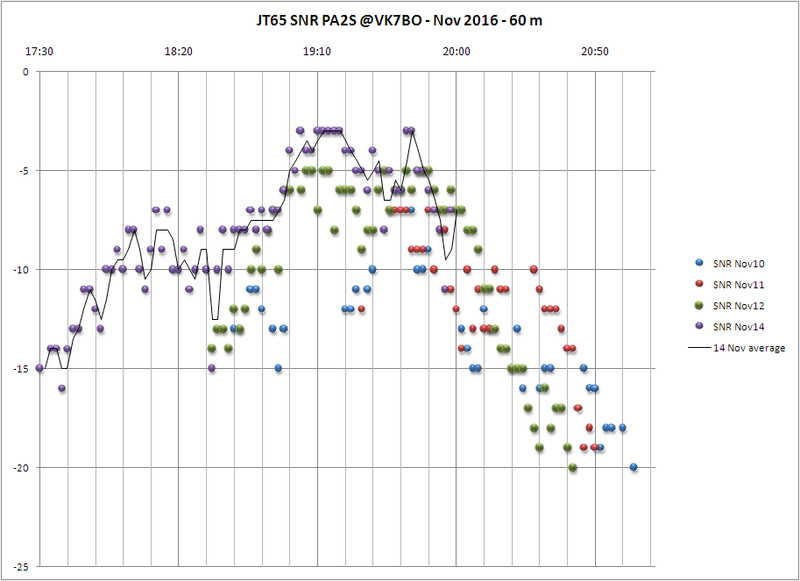 Around 17:30 UTC, one hour earlier than the days before, spots from VK7BO already returned on hamspots.net. The test messages were transmitted every two minutes and good reports returned via the internet. After 19:58, the reports ended suddenly. The signal strength was good at that time (-7 dB), so there must have been something wrong, like an outage or sudden QRM. Half an hour later, I stopped transmitting. Below is a graph, showing 4 days on the time scale. Although the start on the 14th was earlier, the peak is again around the same time as the preceding days. One gets the impression that the early start was an anomaly, because from about 19:00, the spots began following the “usual pattern”.